The MATA would like to thank all the participants that attended a MATA Football Athletic First Aider Course in 2017. For those of you interested in courses this summer, the first course will be offered at the beginning of June. We look forward to seeing you there! This course is open to those individuals looking to assist with community teams providing first aid coverage. Learn how to tape an ankle and manage football specific injuries for higher care. It is highly suggested but not manditory have a valid first aid and CPR to take the course. 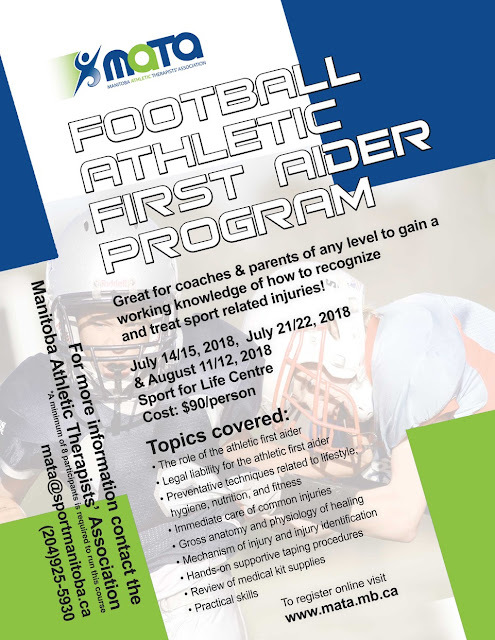 The course is specifically designed for parents, coaches and officials to understand what may happen on the field if an injury arises, immediate care and treatment, and identifying when higher medical assistance is required. Course participants have ranged from stay-at-home parents to firefighters and nurses. Individuals that are exempt: athletic therapists, sports physiotherapists, sports medicine physician (or equivalent). What is a Football Athletic First Aider Course? The program has been operational since the summer of 2005 and is designed to educate individuals providing first aid to football teams.